We’d love your help. 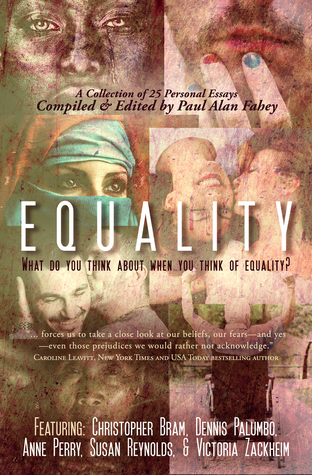 Let us know what’s wrong with this preview of Equality by Paul Alan Fahey. In the tradition of Dr. Martin Luther King’s Stride Toward Freedom and Malala Yousafzai’s, I Am Malala, Equality: What Do You Think About When You Think of Equality? presents thought-provoking and compelling personal essays that probe a concept professed to be the very foundation of our democracy—a concept that may even be more vital today than in the past. From internatio In the tradition of Dr. Martin Luther King’s Stride Toward Freedom and Malala Yousafzai’s, I Am Malala, Equality: What Do You Think About When You Think of Equality? presents thought-provoking and compelling personal essays that probe a concept professed to be the very foundation of our democracy—a concept that may even be more vital today than in the past. From international bestselling author, Anne Perry who asserts we must look within ourselves to our emotions, experiences, and beliefs before we attempt an honest and truthful answer, to Dennis Palumbo, psychotherapist and author, who claims diagnostic labels used in treating mental illness often stigmatize and dehumanize the patient causing clinicians to view their patients in terms of their diagnosis rather than people, and Barbara Abercrombie, writer and distinguished university professor, who explores ageism as yet another form of stereotyping and discrimination in the language we use to describe older adults. These award-winning and best-selling writers, and twenty-two more, tackle equality across multiple spectrums—racial, social, political, religious, marital, gender—and run with it in surprising directions. To ask other readers questions about Equality, please sign up. One of the nice things about being in a collection or an anthology is the ability to discuss the other pieces in the book, and to rub elbows—if in a nonliteral but literary way—with authors both known and unknown to me. Equality: What Do You Think About When You Think of Equality? is a collection of short nonfiction pieces by twenty five essayists, and I’m lucky enough to find myself among them. Equality has been my “coffee shop project” book for the last few weeks. My what? Right. The coffee shop One of the nice things about being in a collection or an anthology is the ability to discuss the other pieces in the book, and to rub elbows—if in a nonliteral but literary way—with authors both known and unknown to me. My what? Right. The coffee shop project is where my husband and I go to a coffee shop on Sundays and sit and read without any electronic devices on-hand, for at least half an hour. I have a tea or a white hot chocolate, he has a coffee, and we reconnect with physical reading, a skill that we’ve both realized can suffer when we’re both given easy access to the ‘net. I finished it this morning, having read a few essays each time. There are twenty five answers to this question, and although there’s some overlap, for the most part, each essayist took a different approach to the discussion, and left me with something new to consider and ponder. It would take me ages to go through each of the twenty-five pieces (well, twenty-four, as I never talk about my own entry when discussing collections or anthologies) but a few echoed over the course of the last couple of months. “The Last Acceptable Prejudice,” by Barbara Abercrombie gave me pause as I found myself nodding along with the words on the page, and Larry Duplechan’s “Have You Met My Husband?” was familiar one moment and then a completely different point of view the next. In fact, all the pieces that touched on marriage equality or queerness were ones that I found myself most captured by (for obvious reasons) and it was fascinating to see the same desires mirrored in other places, other times (Canada was about a decade ahead of the US with marriage equality), and some of the experiences. Should it have surprised me so very much that Jeff Mann’s “Two Mountain Weddings,” had less impediments to them than my own wedding? Maybe not, but my own prejudices about what to expect from the Southern states certainly had me assuming the worst—and being surprised by the tale he told. Many of the stories did that: delivered a tale I wasn’t expecting. The closing piece, “Body Language: The Naked Truth,” by Eldonna Edwards—a woman who donated a kidney and later learned the kidney was given to a man who has politics diametrically opposed to her own liberal, pro-queer ones—were full of such compassion for those to whom I will admit I struggle to be compassionate. My first thought in the face of someone spouting anti-queer rhetoric is rarely as polite as some of those who speak in the pages of Equality. Other standouts? “Equality in High Def,” by Jewelle Gomez (though it has a painful bittersweetness to it now the election is over), “Ambiguously Ever After,” by Jeffrey Ricker (who I speak of often, and whose piece in this collection left me thoughtful and maudlin for days), and “On Equality,” by Rob Byrnes, who managed to level his wit at the topic and put such a wry smile on my face even as he painted so perfect a picture with his words. As I said, I walked out of the coffee shop—and this collection—with a lot to ponder. And while the general consensus of all the pieces in the book was pretty clear: Equality is a goal, not a destination we’re likely ever to truly reach, like all goals, it’s often forward progress that’s more important. A review on the essays could never merit the words on the pages in this simple but powerful contemplation of equity—or lack thereof. Edited by Paul Fahey. A MUST READ! 2017 Rainbow Awards Honorable Mention: Equality: What Do You Think About When You Think of Equality? 1) "Equality: What Do You Think About When You Think of Equality?" consists of essays describing different meanings of equality. Sometimes it's about LGBTQ rights, sometimes it's about understanding people and their various problems. This collection showed me that I still have a lot to do, because even though I fight about equal rights for everyone, there are still issues that I do not think about 2017 Rainbow Awards Honorable Mention: Equality: What Do You Think About When You Think of Equality? Central Coast with his husband, Robert Franks, and a gaggle of shelties. For more information, visit paulalanfahey.com.